Celebrating life, overcoming all obstacles and promoting the positive message of love, peace and harmony has become a mantra for Mike Peters, and it has been well documented the difficulties himself and wife Jules have endured over the past years, but as you’d expect from them both, they have battled head to head and their current album, Equals, highlights some of their best work for years. Playing the Academy 2, this is one of those old school, too hot to handle gigs, with no air conditioning, no windows, no air, hell even the bar has run out of ice, and throughout the set Mike’s shirt gradually changes colour as it becomes drenched in sweat. Opening with Blaze of Glory the band, featuring Smiley and James Stevenson from Joe Strummer’s Mescalero’s, not to mention Jules Jones-Peters on keyboards and backing vocals, are simply on fire, but just after Tomorrow Mike calls a halt to events, as “something is happening here that’s never happened at an Alarm show, there’s a fella here with blood on his face, please get some help to him, and we’ll take a five-minute break”. I’m not sure of the exact details, whether this was an accident or intentional act, but hopefully no-one was seriously hurt. The band return with Marching On, and for the next ninety minutes put on an impeccable show of hope and spirit. The new songs easily fit with the old classics but of course it’s those which has the crowded room singing along, Mike at the front, red acoustic guitar, in his element. There’s an acoustic interlude which is just wonderful, Deeside, Hellfire and Cenotaph which is a standout song from the new album. Before Spirit of ’76 Mike tells us of the days the band met Queen at the Montreux Festival, eventually going on to support them at Wembley Stadium. This was a great story (hopefully an autobiography is in the pipeline) but it saddens me that during this story there are a few people who, after paying good money to see the show, decide their own conversations are more important and talk loudly and chat all the way through the story. It’s becoming more and more common these days, and I’m not the only one to notice and moan about this. The lack of respect for artists and fellow-gig goers does seem to be getting worse and I have no idea why people do it. If you want to talk go outside, or save your money and stay at home. Enough of the soapbox and back to the gig. With such a long career and huge back catalogue there is always going to be the question over what songs do you play, but tonight was just about perfect. We had the expected crowd pleasers Where Were You Hiding (when the storm broke) and 68 Guns and also other essential tunes Rain in the Summertime, Sold Me Down The River but we also had a good coverage of the new album, Equals, and each and every song is equal to those older classics, they fit and knit into each other perfectly, and overall this was, as expected, a triumph of a show. There is a lot wrong in the world today, but the songs and lyrics of Mike Peters give a glimmer of hope. He genuinely is one of the nicest men in the music business, and having met him once and thanking him for his music, he also came across as very humble. He exudes positivity, and this is also proven by his LoveHopeStrength foundation, now boasting over 170 000 members, and recruiting more at every show to be added to the bone marrow donor register. It’s a privilege to be in the same room as him, and to see both him and his wife Jules, having the time of their life is life-affirming. They truly are inspirational. 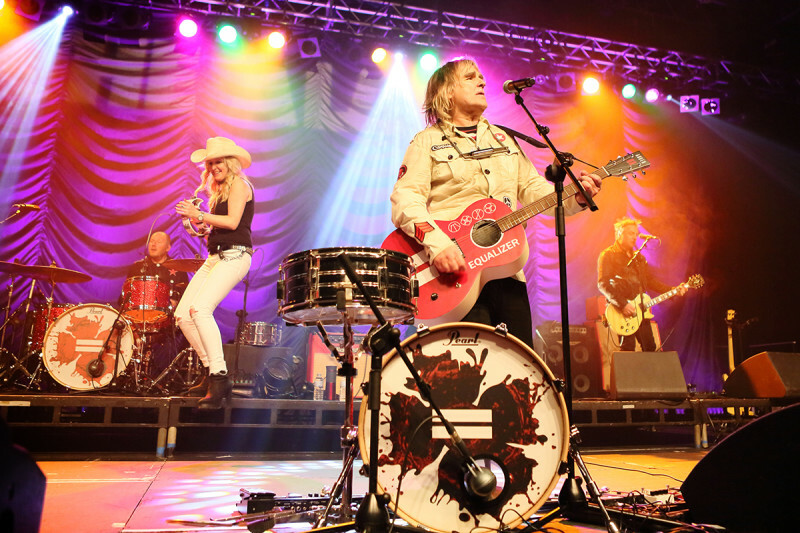 The Alarm continue to tour around the UK, and they play their annual Gathering at Cardiff University on 29th June 2019.